Raspberry Pi is a great choice for all sorts of your creative projects like home automation, robotics, cameras, supercomputers, weather stations, magic mirrors and even mobile phones. But this mini-monster is also great for playing retro games and having lots of fun. You can easily turn a Raspberry Pi into a emulation station by using RetroPie. Just install the RetroPie, plug it to a screen, install classic games and have fun. But if you want to build an awesome arcade cabinet or an arcade table using Raspberry Pi, you may need some tutorials and guides for your projects. There are tons of arcade machine projects using Raspberry Pi on the internet and i collected the best ones in my opinion. Here is a list of 6 Raspberry Pi arcade projects and step by step tutorials to learn how to build them. If you have any suggestions for this list, please feel free to add them into the comment section. This Raspberry Pi arcade table project is built by Bob Clagett from iliketomakestuff.com and it is one of the best arcade projects i have ever seen. 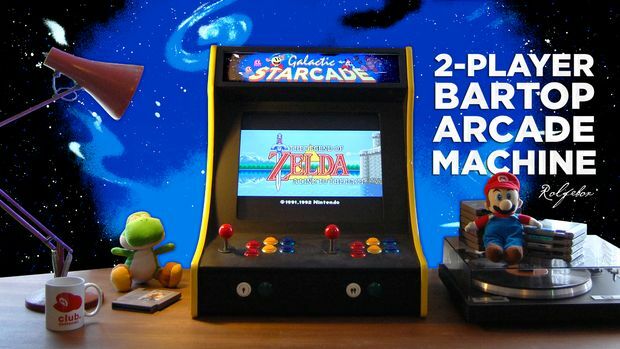 If you want to build this two player arcade table and play awesome retro games with it, you can read his step by step guide using this link. You don’t need any programming experience to build it but you may need a friend to beat him at your favorite game. This bartop arcade machine project is built by Tom Rolfe. He named this little monster “Galactic Starcade”. His project costs under $350 and two players can play with it at the same time. You can find his excellent step by step guide in here. Tom’s guide also includes blueprints of controls, side panels and reference sheet in PDF format to build your own “Galactic Starcade”. If you want to follow him on Twitter, here is the link. 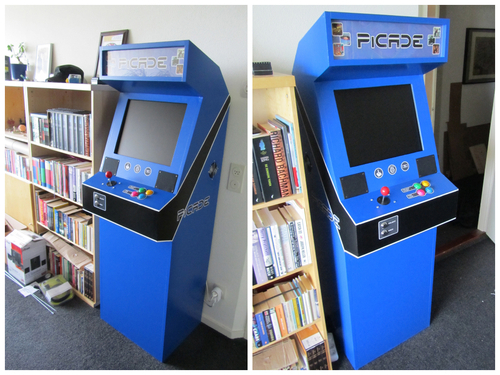 PiCade is a great Raspberry Pi arcade cabinet in original size. Programmer Jeroen Benjamins built this awesome arcade machine and blogged about all of the steps. 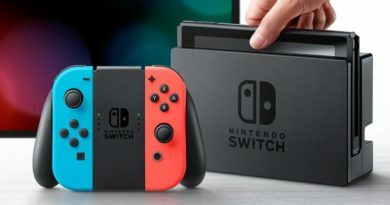 You can learn how to install PiMAME OS, how to connect arcade buttons and how to form an arcade cabinet, in his guide. He also made videos for all the steps and you can find these videos in his blog too. Here is the link for his awesome “PiCade” arcade cabinet guide. 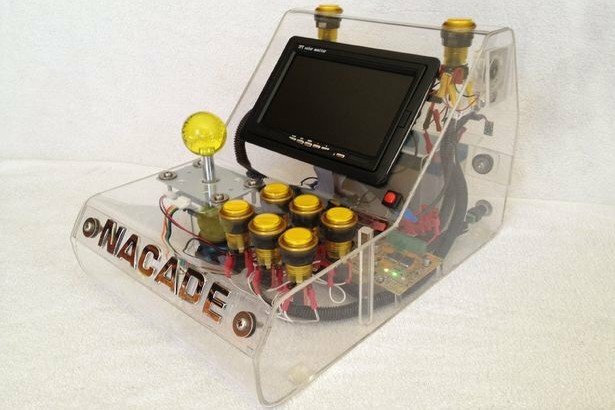 I think NaCade is the best looking Raspberry Pi arcade machine in this list. This awesome project is built by “krimmy” from instructables.com. Krimmy used PiMAME operation system on Raspberry Pi and a 7″ LCD car reversing monitor in “NaCade”. If you want to build this naked Raspberry Pi arcade machine, you can use this step by step guide. It is a very detailed guide that can help you for similar DIY projects. 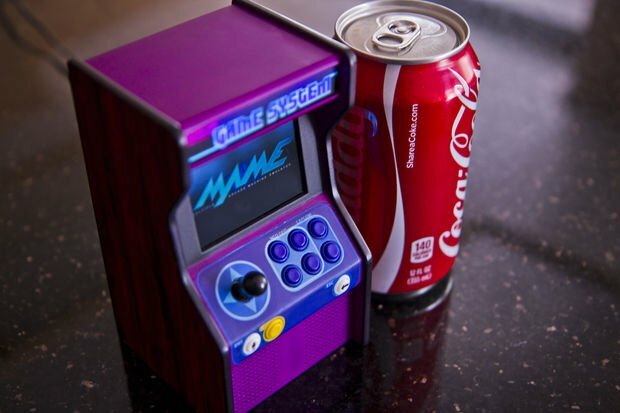 This micro Raspberry Pi arcade cabinet is built by diygizmo from instructables.com. You can build this awesome machine by buying 3D printed parts from here. For this project, you should install Retrogame operation system on Raspberry Pi. If you want to know more about this beauty, check out the step by step guide in this link. Our last project in this list is a great arcade table project by “Aleator777” from instructables.com. You can find detailed blueprints of the table and there is also a wiring guide for controls. Click to watch the video of this awesome machine in action. If you want to learn how to make your very own classic arcade table using a Raspberry Pi, you can find the step by step guide in this link. PS: If you want to check out other Raspberry Pi arcade projects, you can visit this page from Instructables.com.